Nuvo Felt: An Embellisher - now, what else? An Embellisher - now, what else? Well, anyone following my other blog will probably realise why I have been quiet, however, work must go on, so I thought I would offer these thoughts for you today. I have an Embellisher, do I need anything else? I'm not suggesting that you go out and buy a new machine to play with, no, rather asking if there are any other pieces of 'kit' that would be of use. I thought I would tell you about 2 items that I find invaluable. The first is a mini vacuum cleaner. I find this invaluable. It removes the last bit of dust from the machine, and is especially useful around the needle area. 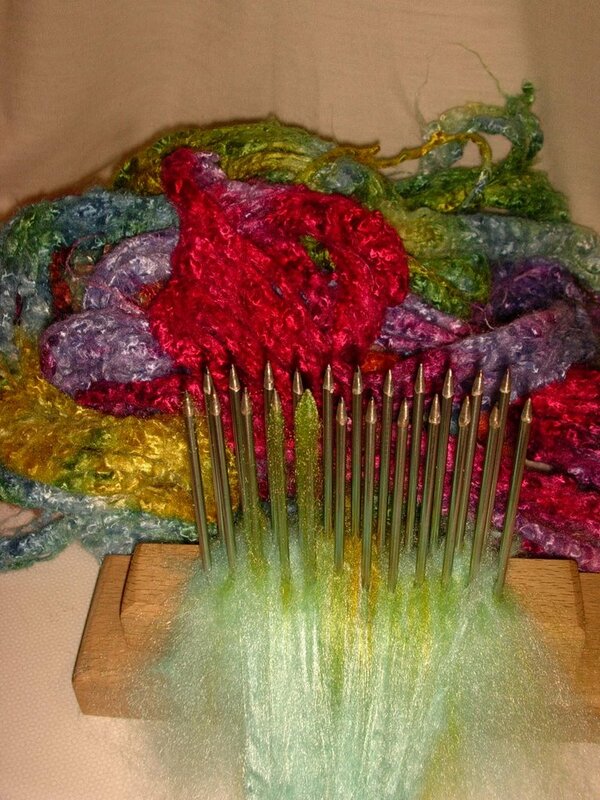 Sometimes it is difficult to remove all the fluff from inside the needles. I have a small battery operated machine, and this just does the job beautifully. The best part is that they are available all over and are very inexpensive. A hackle is an ancient tool for mixing and conditioning fibres prior to spinning. Of course there are other methods of doing this these days, but I find that for The Embellisher it is ideal to have one sitting on the table next to me. It looks a little like a block of wood with a number of nails sticking out! The fibres are gently stroked over the sharp points, and gradually smooth fibres are mixed. I use it a lot, especially when making Nuvo Felt. I don't sell them, but if you need one I suggest you contact Francesa Lawrence at Cae Gwydd, Moelfre, Conwy, LL22 9RL, Wales, UK. While we are on the subject of Francesca, do try this recipehttp://www.farmersguardian.com/story.asp?sectioncode=11&storycode=5298 which I found quite by accident! It's delicious.